My Hexagon Stocking Project For Silhouette America PLUS a Blog Hop Giveaway! To jump start the holiday season and to celebrate all things handmade, the Silhouette Design team is having an awesome Blog Hop! We each made a project using our favorite Silhouette product and are also giving it away (all the information is at the bottom of the post). How awesome is that?!? My favorite product is the Silhouette brand Sewable Fabric Interfacing. I use it in every fabric project I make for their blog, plus a load of personal projects for myself. 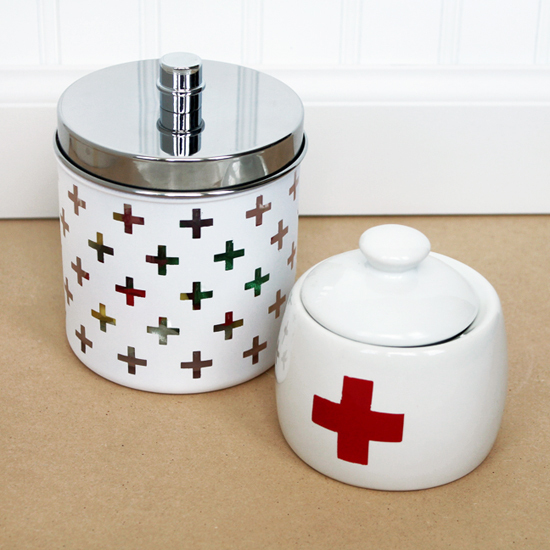 It’s a great time saver that adds a special personal touch to your sewing projects. I use it to personalize quilted pieces or cut super intricate designs. It’s also great for kids clothes and any type of sewn gift. I chose a personalized stocking as the project to showcase the Sewable Interfacing because it’s been on my to do list for YEARS! I started three, one for each of us, but was only able to finish the one shown due to my sewing machine malfunctioning. I’m hoping to share the other two, that my family helped design, later in the month. I wanted to show each of our very different personalities in a quilted sock form. Mine shows my love for shapes, polka dots, fabric with writing on it and the color gray. The Honeycomb Background design file would have taken forever to cut by hand, but with my Silhouette CAMEO it only took a few minutes. I also love how it looks super complicated, but was super easy to put together! I used the Stocking design file and enlarged it as big I could to fit on the 12″x24″ cutting mat. I cut just the basic stocking shape out of card stock. I then opened the Honeycomb Background file and tilted it slightly so the edge near the toe made it look like a sock with those different colored toe tips. I clicked on “Release Compound Path” so all of the honeycomb lines were separated. I deleted a few hexagons here and there so some would be solid. I used some awesome rainbow speckled denim and I wanted to showcase it here and there. Once I was happy with the file, I grouped it back together. I prepped and cut it as a I usually do (my full tutorial on the Silhouette blog can be found here) and ironed it onto my already cut out stocking. I also cut out a basic stocking piece for the back. I then spray basted both pieces to separate cotton batting and quilted them up like I would any quilt. I cut the lining out of the cute black and gray polka dotted fabric and sewed all of them together, just like you would a zipper pouch! After everything was sewn and turned inside out, I folded down the top cuff and added my name using the Lovely Day Font (found in the Silhouette Design Store) and some solid gray fabric to finish it off. It took me about two hours total to finish this one stocking. Not Bad, right?!! On Silhouette’s behalf, I will be giving away one pack of Silhouette Brand Sewable Interfacing and one Fabric Blade. To enter you NEED to follow Silhouette America and myself on Instagram. To earn additional entries you can follow me on Bloglovin and/or leave a comment letting me know what kind of projects you’d like to see on here in 2015! This giveaway is being hosted by me, Jessee M / Art School Dropout, as part of the Silhouette Design Team Blog Hop. There will be only one winner chosen by Rafflecopter. This giveaway is open to US/Canada Residents, 18 & older. Void where prohibited. This giveaway is not associated with Facebook, Instagram, or Pinterest. Prizes will be fulfilled by Silhouette America. Winner cannot have won another Silhouette America giveaway in the past 90 days. Winners should expect their prize to arrive within 4-6 weeks. Only one entry per reader, period. Only the first comment posted will be counted. Giveaway starts at midnight December 1st, 2014 and will end at 11:59PM (EST) December 5th, 2014. Whew, I think that’s it! Good Luck to everyone who enters. Please head on over to Guiseppa Gubler’s blog to find out what she’s giving away. Then from there hop on over to the next one and the next. If all works out you should finish up right back here where you started. If you’d like to start at the begging then go check out the Blog Hop Giveaway post on the Silhouette America Blog. I’m still catching up with all of my Silhouette projects lately! The one above is one of my favorites. Its a set of spray painted bathroom organizers that I wrote a tutorial for. The complete instructions are over on the Silhouette America blog. I can’t wait to share the reveal later this summer! Here is another project I forgot to share on this here blog! It’s probably my favorite to date too since it’s completely customized to ME. 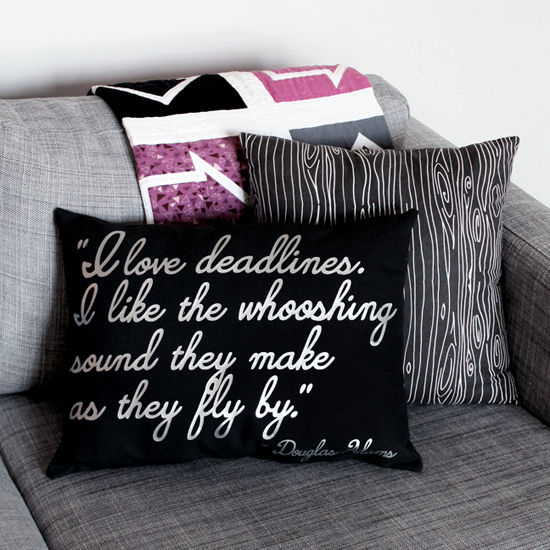 “I love deadlines. I like the whooshing sound they make as they fly by” – Douglas Adams. You can read more about this project over on the Silhouette blog. I’m a bit behind, but here’s my Novelty Cameo Brooch I made for the Silhouette America blog two weeks ago that was inspired by all of my novelty brooch loving friends! There’s loads more information and photos on their blog. 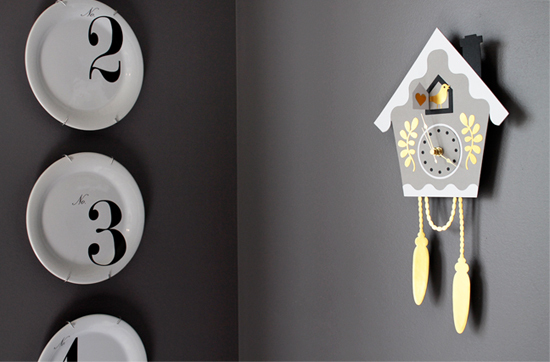 Have you see the fake cuckoo clock I made out of paper for the Silhouette America Blog? If you haven’t, you should check it out!! It’s made out of adhesive cardstock, foil sticker sheets, chipboard and a clock mechanism. I’m not a fan of paper glue, but I am a fan of easy, and this thing was so easy! Yesterday my first post for Silhouette America’s blog went live! The first of many!! (If you missed it you can read about one of my new role’s as part of their 2014 – 2015 Design Team here). It uses the free shape of the week and their Fabric Starter Kit. The process is super simple and yields great results. The coolest part is when people see them they think they are screen printed! Goal achieved. You can read more about the entire process over on their blog here.